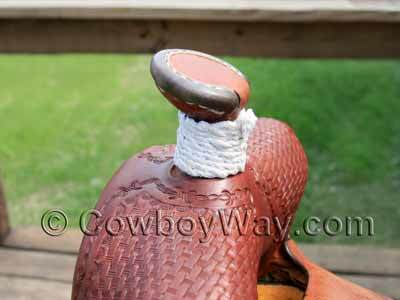 Ropers wrap their saddle horns to protect the horn and to help control how much the rope slides after dallying. Each roper has their own preference about the material they prefer to use to wrap their saddle horn. Common choices include rubber, mulehide, latigo, and more. A brief overview of a few of these materials follows this article at the bottom of the page. 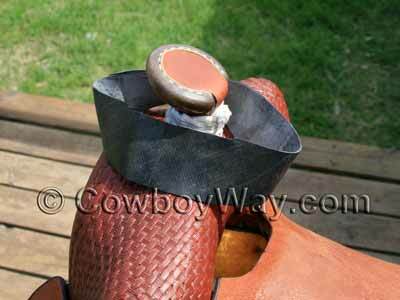 This article will show you how to wrap your saddle horn with rubber. Below: A saddle saddle horn wrapped in rubber. 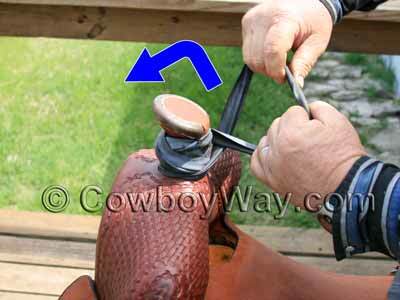 These steps are for wrapping a saddle horn with rubber or synthetic rubber. The technique for wrapping a horn with latigo, mulehide, or similar materials is different. Below: An unwrapped saddle horn. Begin by getting your strips of rubber handy and placing your saddle on a secure surface, like a saddle stand. Place the first strip of rubber over the horn. The rubber used in this article was new rubber cut into strips from a new, unused, inner tube. Each strip was a little less then than two inches wide. Standing in front of the saddle, pull the strip of rubber to you. 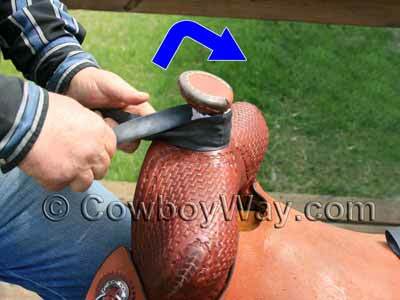 Pull it firmly, twist it one time, then loop the rubber up and over the saddle horn toward the back of the saddle. See the blue arrow. Keep the rubber as smooth and flat as you can. If necessary, brace against the saddle and/or saddle stand to keep them from sliding. Keeping tension on the rubber, step to the other side of the saddle horn. Pull the rubber firmly toward you, twist it one time, and loop it back up and over the saddle horn toward the front of the saddle. See the blue arrow. Again, try to keep the rubber as smooth and flat as you can. As the rubber gets tighter this can be more difficult as it will tend to want to curl when you pull on it. Keep repeating the steps above until the rubber is too short to loop over the saddle horn again. Get another new piece of rubber and continue wrapping. Many ropers will wrap the final, or outside, layers less tightly than the inner layers to allow the rubber to stay more flexible so the dally can grab the rubber better. Make the wrapped horn a uniform thickness from top to bottom. The finished saddle horn shown in the photo below used three pieces of rubber from a new inner tube cut into strips not quite two inches wide. If you are using narrower pieces of rubber, which are common, you will likely need to use more pieces. The materials used to wrap a saddle horn fall into two broad categories: 1) rubber, which includes synthetic rubber, 2) and "slick horn" materials. Rubber and synthetic rubber provide a strong "grab" on a rope. "Grab" means that the rope will slide very little while dallied. Competitive ropers such as team ropers often use rubber or synthetic rubber. It is also a popular choice for ranch use. Slick horn materials (which include latigo, mule hide, elk hide, and others) allow the dally to slide more easily. Slick horn materials are popular for ranch use and competitive ranch roping. A brief description of some common rubber and slick horn materials follows. If you'd like more information, we suggest you simply ask a roper their opinion. 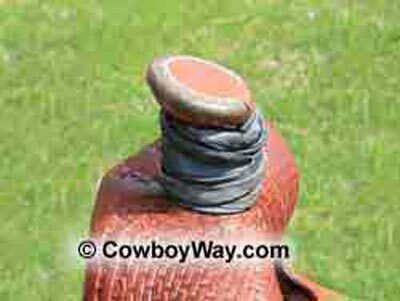 Rubber - An inner tube that the roper has cut into strips themselves is a common source of rubber for wrapping saddle horns. A new inner tube is the best choice since the rubber in a used one may be somewhat damaged or degraded. Rubber has a lot of grab on a rope. Synthetic Rubber - Synthetic rubber is purchased pre-cut into strips and ready to wrap a horn. It comes in different colors with white being especially popular, partly because it does not rub off and stain ropes. Some makers of synthetic rubber horn wrap claim it is easier on ropes than real rubber. Like real rubber, synthetic rubber has a lot of grab. Elk Hide - Fans of elk hide usually say it has less grab than rubber or synthetic rubber, but more grab than mulehide or latigo. Mule Hide - Despite the name, mule hide is made from cowhide, not mules. It is usually considered to have less grab than elk hide, but more grab than latigo. Latigo - Latigo is a type of leather made from cowhide. It is generally considered to be slicker (have less grab) than either elk hide or mule hide. Those who use latigo as a horn wrap sometimes say it seems to outlast elk hide and mule hide, but this can be disputed among ropers.